One of the greatest tools you can have when you’re looking to make more nutritious food choices for yourself and your family is knowing how to read and understand nutrition labels and ingredients lists. We get it. It can be incredibly daunting just trying to pick the food you want to eat, let alone comparing the nutritional value of a few different brands! 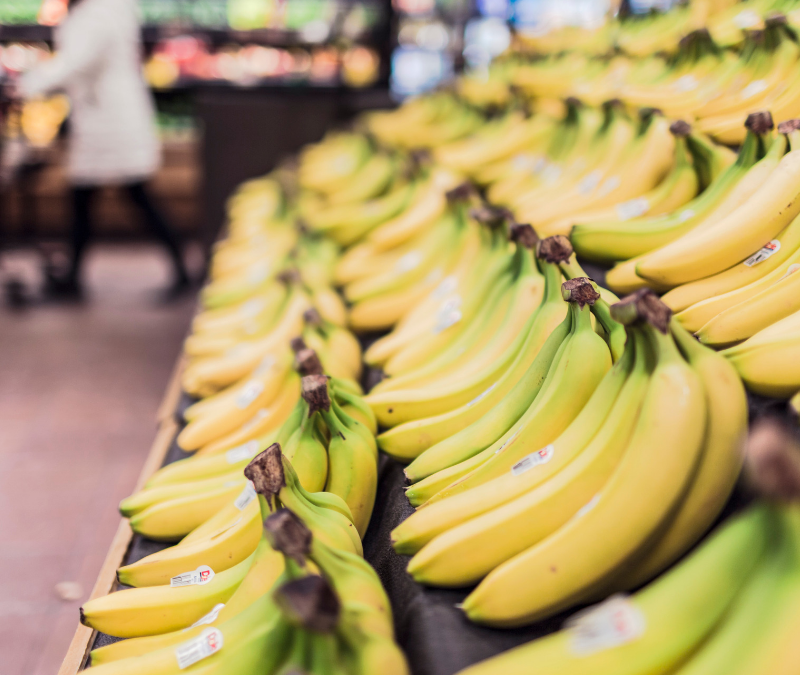 We’re going to give you a few easy quick tips that you can use on your next trip to the supermarket which can really help you get the absolute most from your food and eat for your goals. 1. What’s in the ingredient list? Forget the nutrition label altogether and have a look at the ingredients list first and foremost. This tells you a lot about the food that is in your hot little hands. 2. How are the ingredients ordered? Above is the nutrition panel on a packet of brown rice chips. Straight away we can see that the first ingredient (which I’m thinking would be brown rice) is actually just rice flour. So without even looking at anything else I can tell that these brown rice chips are made up mostly of regular rice flour and white corn flour, with brown rice only coming up third in the list. 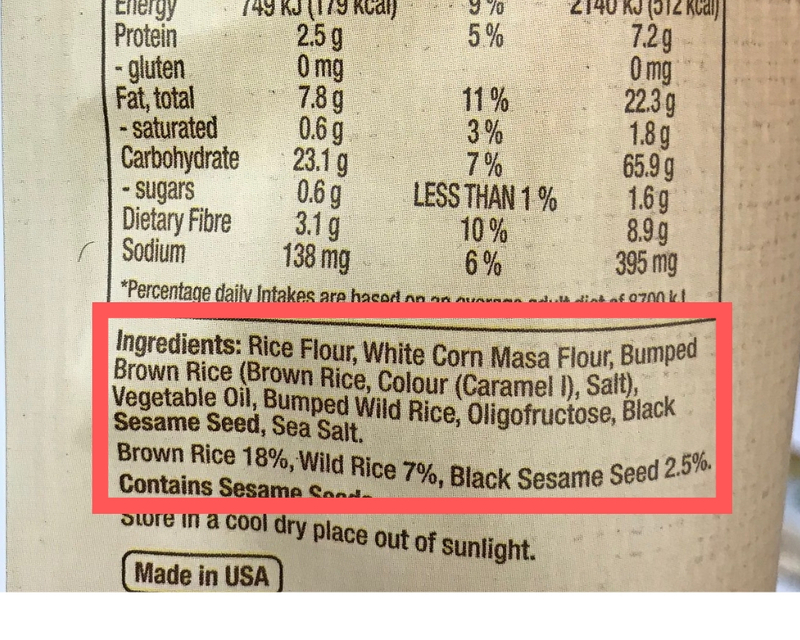 Now – this isn’t necessarily a bad thing, it’s just interesting to know that really you’re buying corn chips that are marketed as brown rice chips…just because there is a little bit of brown rice in there. So if you are after something that is a little more natural and less processed you might opt for a different brand of crackers with an ingredients list that is 100% brown rice. 3. How long is the ingredient list? A rule of thumb with ingredient lists – generally the longer the list, the more processed the food is. This is a really easy one you can apply if you are trying to eat more simple foods that are less processed. If you don’t know every ingredient, or you can’t pronounce them – maybe have a look at something else. Take this nutrition panel from a protein bar for example – it has a huge ingredients list and chances are we don’t know what half of them are! Now, this is marketed as a “healthy” protein bar, but have a look at the nutrition label and you can bet that not even half of those ingredients are going to help you towards your goals. Also, it has a scarily high Sugar Alcohol content – that’s a whole different kettle of fish – so if you want to know more about that, check out our blog on Sugar Alcohol. Satisfied with the ingredient list? Let’s move onto the nutrition panel! 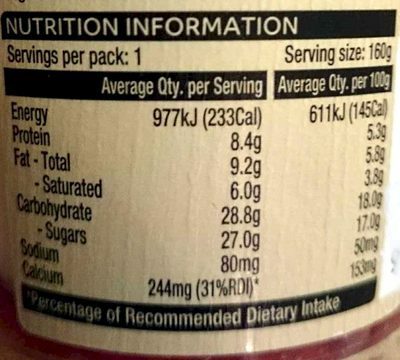 This one can get a lot of people stuck when they read a nutrition panel because the serving size column might have relatively low numbers and you’re thinking ‘HELL YEAH’. However… what you’ve missed is that the serving size is only a tiny 20 gram serve and deep in your heart you know it’s pretty unlikely you’re going to stop at 20 grams of chips. Avoid being caught out and always read the 100g serve column – especially when comparing different brands of the same foods as all serving sizes can be different! To see what we mean check out how quickly the sugars, fats, and carbs add up on this popcorn if you eat more than the recommended serve. A handy tip to remember is that 4 grams of sugar equal 1 tsp. 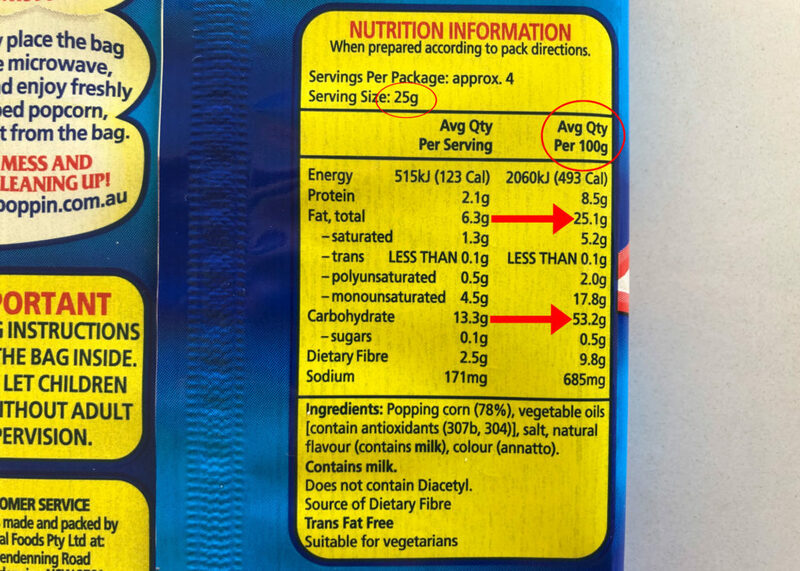 So, let’s say our nutrition panel says 8 grams of sugar per 100g serve we can picture that as being 2 tsps, and if it says 16 grams of sugar, we know that equals 4 tsps of sugar. Whether it’s natural or artificial, we know that a lower sugar content is most likely going to help us toward our goals so just be mindful to not overdo this. Something that can often get us caught out in the sugar department is yogurt, it’s something that most people generally assume is quite healthy for them – but there can be a lot of sugar packed into a tiny yogurt. Again – apply your knowledge, check that ingredients list then read the sugars on the nutrition label. For example this single serve of Gippsland Dairy Yoghurt has almost 7 teaspoons of sugar. While some of it will be natural sugar from the fruit there is also a lot of added sugar too so it’s a good idea to have a look at the back before you buy! Got your nutrition sorted and want to take your training to the next level? Enquire today and join us for our Autumn Cycle at 141Fitness!